Eddie has worked with Toons before (in the first novel and the movie), and he doesn’t want to repeat the experience; especially when he learns that Coop’s co-star in this movie will be Roger Rabbit, who Eddie knows better than he likes. But Sands reaches into his drawer and “pulled out a wad of simoleons so thick he needed both of his tiny hands to lift the stack. He set the moola on the desk between us.” (p. 15) Eddie takes the case. Who Wacked Roger Rabbit? is closer to the Disney movie than to Wolf’s first novel. Roger Rabbit is still alive, and with an important Toontown profession rather than being a minor second-banana actor. Toontown is a zany Toon ghetto, rather than the Toons living spread out through Los Angeles. The Toons speak in word balloons while in Toontown, and in regular speech elsewhere, rather than all one or the other. Eddie has to exchange his .32 Smith & Wesson pistol and his sawed-off shotgun for a cap pistol and a shotgun that produces a flag that says BANG! when he enters Toontown, because they’re funnier. He also, because he’s so sour-faced, is given a cute puppy that he’s required to keep with him for laughs. “The puppy’s idea of making me happy was to pee on my leg.” (p. 37) When Roger is introduced, he makes an allusion to his famous movie slobbering his P’s, but he fortunately talks in normal speech (or word balloons) for most of the novel. The reader can discover for him/herself which parts of Who Wacked Roger Rabbit? are more like Who Censored Roger Rabbit? and which are more like the Disney movie. All of the original Disney characters are replaced by lookalikes. Instead of Benny the Cab, Roger as a wannabe outlaw biker rides a giant talking motorcycle, Charlie Cycle, with an eyeball for a headlight. The plot that emerges from all the zaniness is that Willy Prosciutto, the crime lord who runs Toontown (“One of the movers was a massive Toon swine. His overweight, jiggly body demonstrated the ugly result of gobbling double helpings of slops and swill. The porker wore the pinstriped suit favored by costumers of third rate gangster movies. The suit’s overly broad shoulder pads forced the pig to turn sideways whenever he walked through a doorway. The brim on his fedora was the same circumference as his ample belly. [etc. ]” (p. 49), doesn’t want the movie made, for unknown reasons. Eddie, Roger, Gary Cooper, Barney Sands, Miss Ethyl Gravitz (Sands’ super-efficient secretary), and the puppy Mutt have to confront Willy Prosciutto and his gang: Louie Louie Louse, his henchbug; Honey Graham, his moll; Boss Tweedeedledum, the corrupt two-headed Mayor of Toontown; and the whole crooked Toontown police force. Jessica Rabbit is mostly offstage at first. (Her appearance is worth waiting for, for male readers. Wolf takes advantage of Who Wacked Roger Rabbit? being unillustrated to describe her in more revealing detail than Disney could show.) Her description is still vague enough as to be impossible to say whether it matches her appearance in the movie. It rapidly becomes obvious that Wolf had to avoid the Disney movie as much as possible. 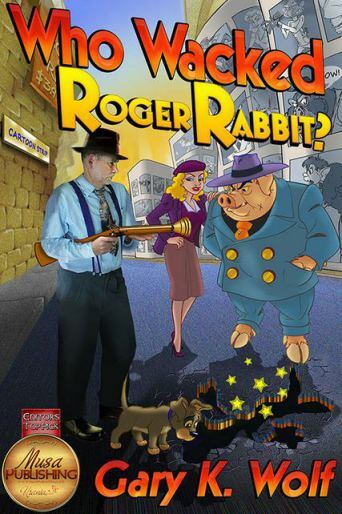 The novel’s cover is by Jacques Muller, one of the animators on Who Framed Roger Rabbit, but it doesn’t show either Roger or Jessica. Instead it features Willy Prosciutto, Honey Graham, and Mutt – all original characters in this novel. The fourth character, holding the Toon blunderbuss, is supposed to be Eddie Valiant. Gary Wolf posed himself for this photograph as Eddie. He also appeared as Eddie on the dust jacket of Who Censored Roger Rabbit? in 1981. Then, the 40-year-old Wolf looked reasonably like a tough private eye. Today, he’s a bit long in the tooth for the role. There are plenty of other funny animals among the Toons, such as Ask Me My Name, the gorilla customs agent at the Toontown entrance; Twentieth Century Fox (a.k.a. Wunderfox), a Toontown vulpine teenaged cartoon director; Catman, a feline former superhero actor now selling used anthropomorphic vehicles at Car Toon Terrace, and Tweeter, his old co-actor; Hardware Henri, a lobster tailor and fashion designer; Hippity Hopper, a female kangaroo scriptwriter; and Delancy Duck, the publisher of Toontown’s newspaper. Humanoid Toons include Doc Trinaire and Annie Mation. Who Wacked Roger Rabbit? rambles a lot to get in all the Toons. Most of them turn out to be much more serious than Roger, or than what Eddie has been told that all Toons act like, such as the sadistic Louie Louie Louse. The mystery is also serious. An important supporting character is murdered, except that Roger and Gary Cooper get glimpses of him walking around. Is his death phony, or is someone faking that he’s still alive? This also makes the threats against Barney Sands and Gary Cooper seem more deadly. Who Wacked Roger Rabbit? is good fun, especially for furry fans who enjoy funny animals. It was originally published by Musa Publishing as a $4.95 e-book in November 2013. It published this trade paperback edition in December 2014. On March 1, 2015, Musa Publishing went out of business, and the e-book edition disappeared. Readers are advised to act fast before Amazon.com runs out of its stock of the paperback. Since the “toniest” doesn’t have a [sic] I’m guessing that’s an article typo? Should that be tooniest? It’s always interesting to note when visual medium impacts non-visual medium. But it also seems to be a theme that books are also far less censored then their visual counterparts. I think it’s as if literacy begets some sort of mark of maturity that being able to see visuals does not. If a child is old enough to read and digest a written work, and they’re old enough to understand the concepts therein, most of those who are more ‘censor happy’ tend to not be as hard on the censoring. Either that or when it comes to reading people are more apt to get upset over the philosophies or ideologies presented by a book rather than the way they are presented. Violence/sexual content aside. “tony” means swanky, classy, and might be used because it’s so close to toony… anyways, another cool thing about books is how access to self publishing further reduces the bad side of gatekeeper power. My sister Sherry currently has my review copy, so I can’t check the spelling, but I’m pretty sure that it said “toniest”, not “tooniest”. Check the context. Eddie Valiant uses a lot of sarcasm. Gary Wolf in all three novels, set in Hollywood in the late 1940s, equates toons with Blacks; e.g., under Whites and Hispanics. (The Japanese had all been deported to far-off internment camps during WWII, and the social establishment at the time was trying to make sure that they didn’t return. The Chinese and other Orientals were almost nonexistent then.) It would make sense for Columbia to specialize in toon movies, since Columbia (then under Harry Cohn) was considered on either the lowest rung of the major movie studios like MGM, Warner Bros., Paramount, and 20th Century-Fox, or the top of the Poverty Row studios like Republic, Monogram, and Hal Roach. A cheap private eye like Eddie Valliant wouldn’t consider the difference. Any studio large enough to have a lot with several sound stages, a big wardrobe department, etc., was “a top shop”. I have some personal experience whereof I speak. My mother worked for Columbia as a script analyst in the early 1940s, when I was an infant. She liked to tell the story of once, when my grandparents were apparently unavailable and my parents couldn’t get a baby sitter, she brought me with her to Columbia for the day. Glen Ford bounced me on his knee, and I peed all over it. I really don’t remember at all.